Worker looks through Atmosphere (PRIMARK) and Cedarwood State stock at the Tung Hai sweater factory, Bangladesh, on May 9th 2013. 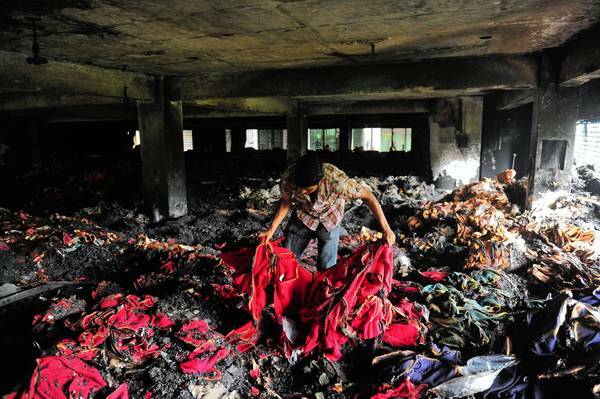 On May 8th another garment factory went up in flames in Dhaka, Bangladesh. Fortunately, the fire broke out in the middle of the night so that garment workers were not there. However, a meeting was taking place with the factory owner and several local political figures when the fire broke out and eight people were killed. Full details are here. Here @SlowTextiles we are building a database of all the industrial accidents that relate directly with the textiles industry from polyester nurdle spillages to factory fires. If you’re interested to join in, please get in touch. Previous article#TextilesIndustryWhat Is It About Textiles?